Botany is one of those passions you can engage in almost anywhere – this could be spotting dandelions brightening in the lawn, ivy-leaved toadflax scrambling up the wall or whitlow grass offering a tiny bunch of flowers beside the pavement. 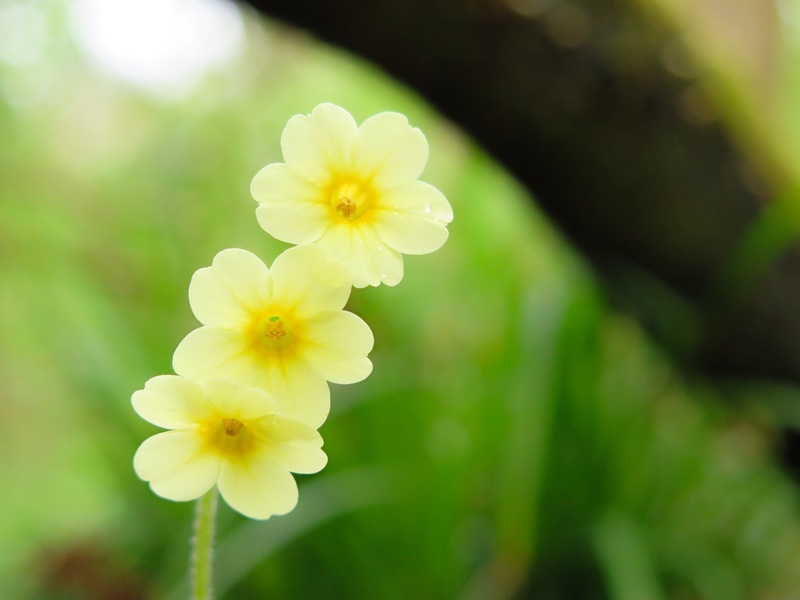 Sometimes however, a flower requires a pilgrimage and oxlip – Primula elatior – is one of those species. 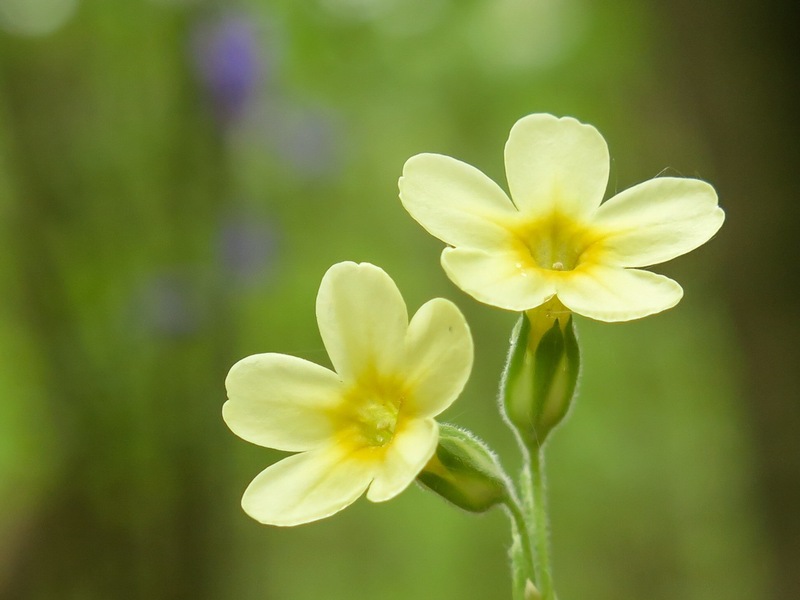 A rare woodland flower, somewhere between a cowslip and a primrose in appearance, it’s distribution is largely restricted to the point in the country where the counties of Essex, Suffolk and Cambridge meet. Hayley Wood has always been in my head as the destination for this pilgrimage – I can’t for the life of me recall which book which introduced me to the name but it has always stuck. Situated near Cambridge, Hayley Wood is an ancient woodland, mentioned in the Doomesday book and owned, managed and protected by the Wildlife Trust for Cambridgeshire, Bedfordshire and Northamptonshire since 1962. 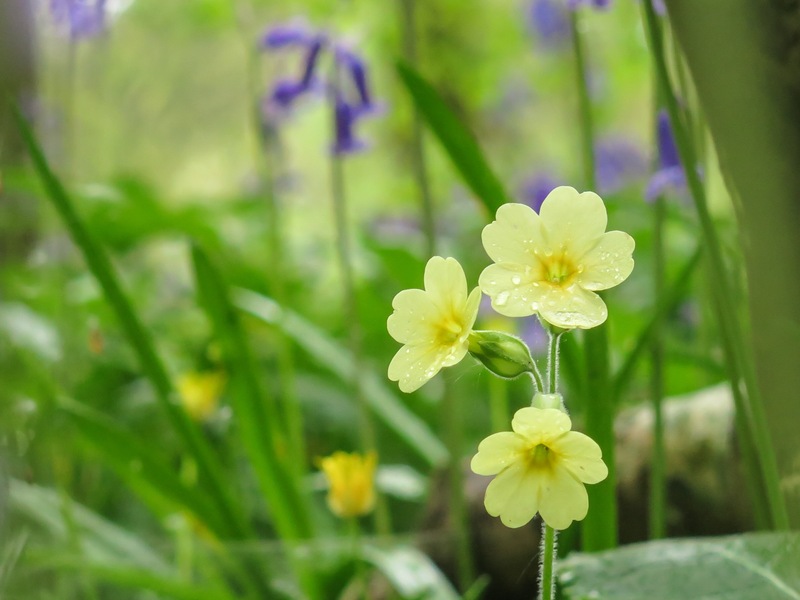 It plays host to a wide range of ancient woodland species – I spotted dog’s mercury, bluebell, yellow archangel, bugle and lesser celandine to name but a few. 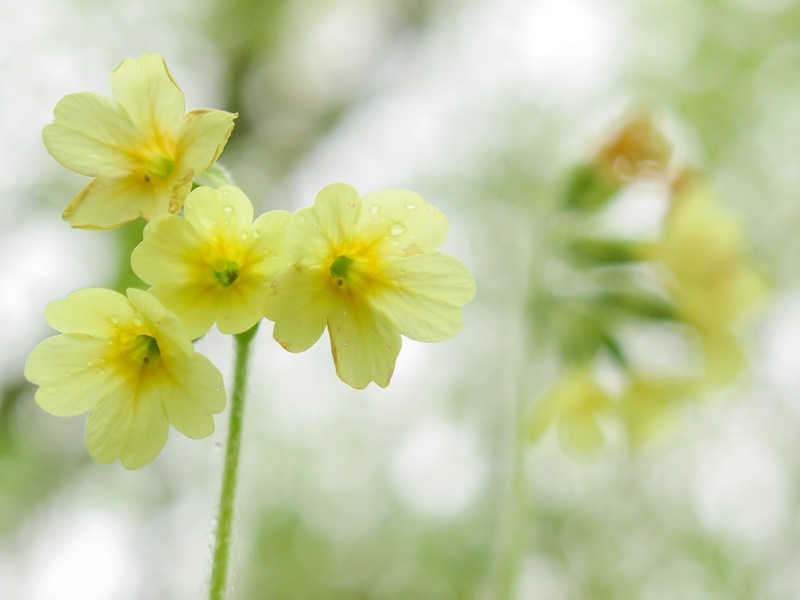 I hope to return later in the season to seek a few more of it’s treasures but this day was all about the oxlip. My job is much concerned with the facts and figures of ecology and wildlife. We collate lists of plants on a site, or identify the protected species present, or count the populations of newts or reptiles. This allows abundant opportunities to get out of the office and encounter all kinds of habitats and wildlife, but the focus on the factual can miss a whole facet of what the wild means. The Nest Collective’s ‘Singing with Nightingales’ was a perfect opportunity to transcend the cold biology and experience the deeper essence of one of our most charismatic species. So on Easter Sunday, we drove down to Fingringhoe Wick – an Essex Wildlife Trust site on the south Essex coast – calling on the way to pick up some friends. We parked up and followed the handmade signs taking us off through the trees. It was only 6:30pm – hours before sunset – but we already picked out the song of an impatient nightingale trilling and whistling amongst the gorse and willow. Reaching the glade within the trees, Sam Lee – our host for the evening – welcomed us along with the other guests, and we settled around the fire for introductions and drinks before the expert ornithologist Tom Stuart led us on a walk around the hills and hollows of the reserve to introduce us to the soundscape of the dusk chorus. Tom conjured the reserve’s journey from an old gravel workings through stages of succession and management to the diverse habitat we were now walking through, and explained how the Essex WT maintained the mid-stage scrub which is essential for the nightingale. As the sun sank into obscurity, we returned to the fireside for a delicious vegan curry and carrot cheesecake before Sam broke the fireside chatter with the first of his mesmerising songs. He went on to describe the prominence and place of nightingales in lyrics and folklore, interwoven with song and poetry. Whilst Sam evoked the mythology of these elusive birds with romantic flair, Tom described the biology and behaviour of the species with scientific yet equally mesmerising effect. To focus on the ecology alone misses the cultural and creative importance of these birds which have sung by our firesides for centuries and the Nest Collective weave these two strands perfectly. As we approached 11 o’clock, we walked out across the reserve, following in Sam’s footsteps both literally and mechanically; without torches we were taught to walk like foxes, toes first to feel for uneven ground and move with the undulating terrain safely. We had been to the depths of the Sussex forest with Sam and Ezra last year to hear the nightingales, but they had been reluctant to sing. Tonight however, we walked between serenading males, auditioning them until we paused beside a particularly fluent vocalist. We stood in silence, listening to the surreal exotic song of this African visitor, before Sam’s first accompanying note appeared gently in the air as though it were always there. He sang ‘Down by the Tan Yard Side’, dueting with the nightingale whose notes fell into the pauses between the lines or overlapped and accented them. The inspiration for these intimate, outdoor gatherings came from the history of musicians playing with nightingales, most notably live on BBC Radio in the early part of the 20th century. Every May from 1924 – when it was the first ever live outside broadcast on the radio – the cellist Beatrice Harrison played with the local nightingales in her back garden in Surrey. This continued until 1942 when the live broadcast picked up the drone of allied bombers flying overhead on their way to the continent. Realising that this would give warning of the impending raid, the BBC pulled the plug and there the tradition died. Until 2014 that is, on the 90th anniversary of this first recording, when Sam and two companions travelled to a secret location to re-enact this event for a live BBC broadcast once more. 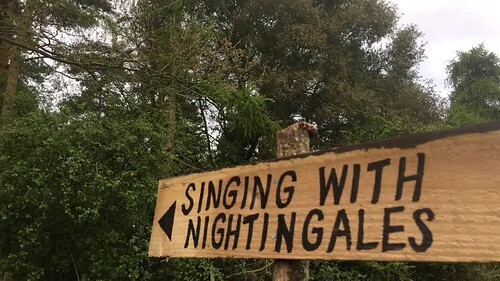 This sparked the enthusiasm for this tradition, and the Singing with Nightingale events – now at a range of locations around the country – have sprung from this. With a gentle hum, in resonant and fluent imitation of a cello, Sam sang along with his chosen accompanist, just as the low drone of a Stanstead-bound aircraft broke on the horizon. With the fireside tale of the history still fresh in our memories, this otherwise unwelcome intrusion of the modern world in fact provided a poignant and fortuitous resonance of that final BBC broadcast. We left this nightingale and walked back towards the cars at 1am – only to be captured by another who was impossible to walk on by so we gathered beneath its willow podium. In the darkness, images come unbidden and the soundscape surrounding us was like seeing beacons being lit as these birds sang in their individual islands and the songs sparked motifs and patterns which were heard and echoed, repeated and elaborated and embellished by others across the reserve. The Nest Collective, set up by Sam in 2006, takes music to unusual venues and unique settings, and these events combine history and folklore with ecology and conservation, all bound together through song and poetry and good fireside company. This was our second year experiencing this magical night, and I very much hope it won’t be our last. You can find out more about the series at the Nest Collective’s website here, or get a taste of the evening in this 90th Anniversary broadcast on BBC Radio 4.